Today's leaders simply can't succeed without putting creativity in their toolbox. If you don't think you're creative, that may sound discouraging. 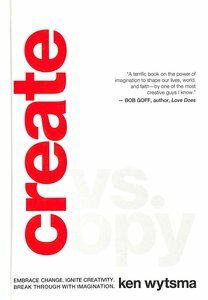 But take heart: creativity can be taught and practiced, and Create v. Copy shows you how. This short, punchy book explores various aspects of creativity and imagination and leads you toward a healthy, confident, more innovative life mindset. It celebrates the good news of your God-given capacity to create and helps you harness it to take charge of your life, navigate changing times, and, ultimately, flourish and succeed. Having traveled to dozens of countries, founded the leading international conference on justice and theology, and collaborated with scores of nonprofits, Wytsma is uniquely fit to help us be culture-shapers in a world of global change. He blends theology, history, and cultural observation to show us what being God's creative image-bearers might look like today. Whether you're a parent, CEO, pastor, or politician, this fresh look at contemporary leadership will challenge the way you view your position of influence, and it will equip you to adapt and thrive in our perplexing yet exciting cultural climate.